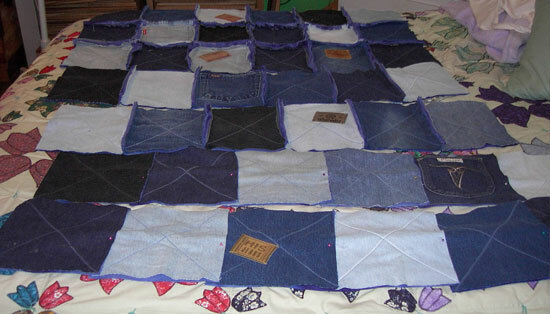 Rag Quilts Made With Blue Jeans. Rag quilts are the latest fad in decorating your home. Do not be confused with a rag rug. They are very easy to make and a lot of fun. 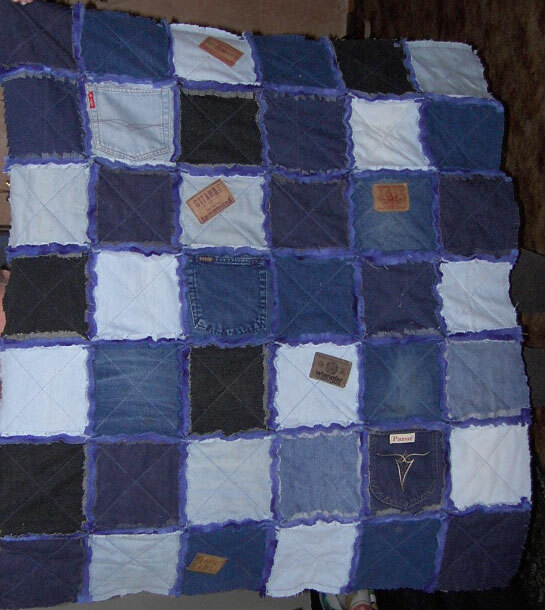 This rag quilt was made with blue jeans and is very warm. 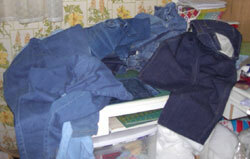 All you need are a few old blue jeans and some fleece. Cut out your squares whatever size you want. I had to make mine 7 7/8" because I wanted the pockets in some of the squares. I also took some of the labels off the jeans and sewed them on the squares. You need to cut the fleece the same size as your jean squares. Put a jean square and a fleece square wrong sides together. Mark an X on the jean square I then sew on the lines as pictured above. This also makes the back all quilted when you get done sewing the squares all together. The next thing you need to do is layout the squares after you have all of the fronts and back done. I lay them on my bed and move them around until I have them just the way I want them. After you have got them just the way you want them you need to sew the rows together. To do this just take the first two in a row and align the backs together and sew a 1/2" seam. Remember that you want the edges on the front. Keep sewing until you have a row done and then go on to the next one. After you have all of the rows done then you need to start sewing the rows together. I usually sew about half the rows together and then the rest together. The rag quilt starts getting kind of hard to handle. After I have these sewn then I sew them together and I know have a rag quilt. Now then you need to cut all of your edges on each square. Make a cut about every 1/2" but be sure that you don't cut the seams. This is when your rag quilt really starts to look nice. The quilt looks even better after you have washed it. Just remember that you are going to get a lot of little strings in the wash so be sure you have a filter on your washing machine. Most of the people I have talked to take theirs to the laundrymat to wash it the first time. And this is my finished blue jean rag quilt. These quilts are so very soft and cuddly that you just want to curly up and relax with them. They are excellent for your lap on a chilly day and are prefect gifts for kids or adults. Donâ€™t forget to make one for yourself. How about one for your car. The kids love them to cuddly up with. They go together quickly and you can make yours in a weekend.